Our family consists of Sierk, Astrid, daughter Ilse and son Alex. We live in a little village called Streefkerk situated in the surroundings of the famous windmills of Kinderdijk and not too far from Dordrecht and Rotterdam. When we visited relatives in 1990 we saw a Norwegian Forest Cat for the first time and I (Astrid) was “hooked”! In 1992 we bought the first two Norwegian Forest Cats. In December 1995 we got our first litter and since January 1996 we are official registered as cattery “Thule’s” and member of the independent club “NEOCAT”. We are a small scale cattery and want to stay this way. The cats are a part of our family in the first place and live with us mainly for company. We spend a lot of time with our cats and from time to time we have a litter. They will be born and raised in our house with other cats and children. This is the place we are most of the time, so we can give them the time and devotion they need to grow up into social cats. Sierk has built a big outdoor run for the males next to our house and enclosed a part of our garden with a fence; this gives the cats the opportunity to go out if they feel like that. Several times a year we visit cat shows. As a member of an independent cat club I also visit Fife shows from time to time. I usually sign up as steward because I want to learn and I have noticed that being a steward is a good opportunity for just that. We want to breed healthy cats with a good temper. 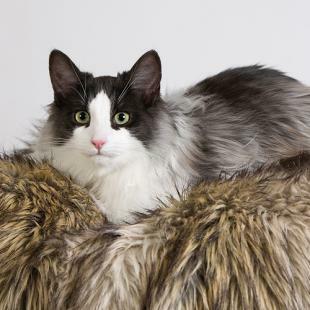 The Norwegian Forest Cat is known as a harmonically and strong-built cat with a double coat and tufts on their ears. We believe that the waterproof coat and the look make the Forest Cat special. Therefore we should not forget the standard of the NFO. We like to have good contact with our kitten buyers and they have to feel free to contact us about anything concerning their new family member.